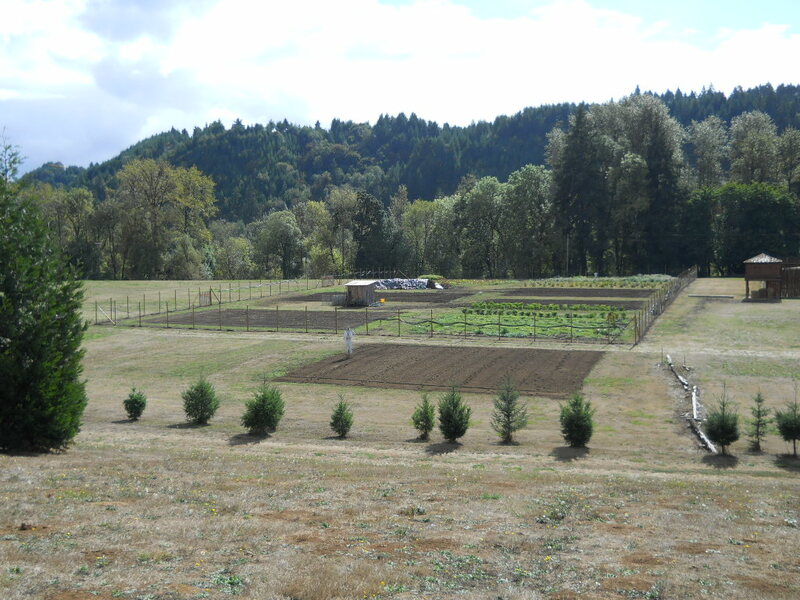 A couple years ago a woman from the Elkton Community Education Center (ECEC) came to speak at the local Eugene Garden Club. She gave a presentation on the community center and butterfly pavilion that she and members of the community had constructed in the small town of Elkton, about 55 miles north west of Eugene on Hwy 38 that leads to the coastal town of Reedsport. 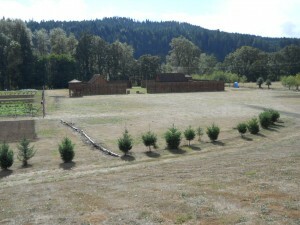 The community has also built a replica of Fort Umpqua there, which originally was the southernmost outpost of the Hudson’s Bay Company back in 1836. It was her presentation that inspired me to learn more about butterflies and to start focusing on how to create a more butterfly friendly garden along with my bee friendly garden. When I heard about the Elkton Community Center, I knew this would be a place my dad would also enjoy seeing since he’s such a history buff, and being so close it was a perfect destination for a day excursion. After a big breakfast at the Busy Bee Café we set out for Elkton. 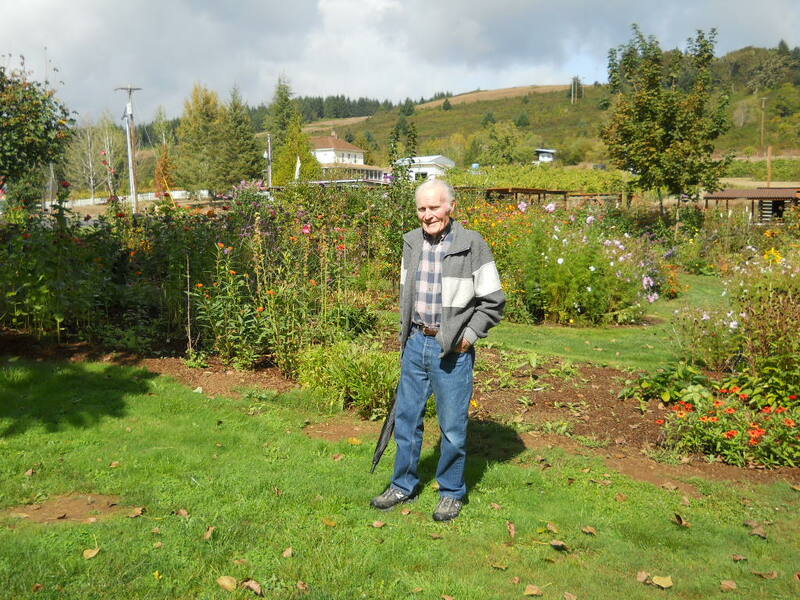 It was a perfect early autumn day in Oregon, and I was looking forward to spending some time with my dad and exploring this new place. On the way to Elkton you pass through Drain, which is also a charming little town of barely 1,500. 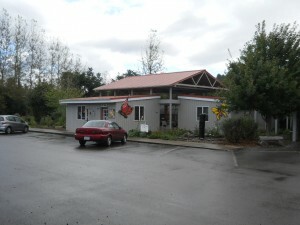 When we arrived to the community center in Elkton the library was closed, but the rest of the center was open. We said hello to a couple volunteers in the office who were very friendly and informative, and then got instructions for where we could go to see everything. After a quick walk through in the gift shop, our first stop was the butterfly pavilion. 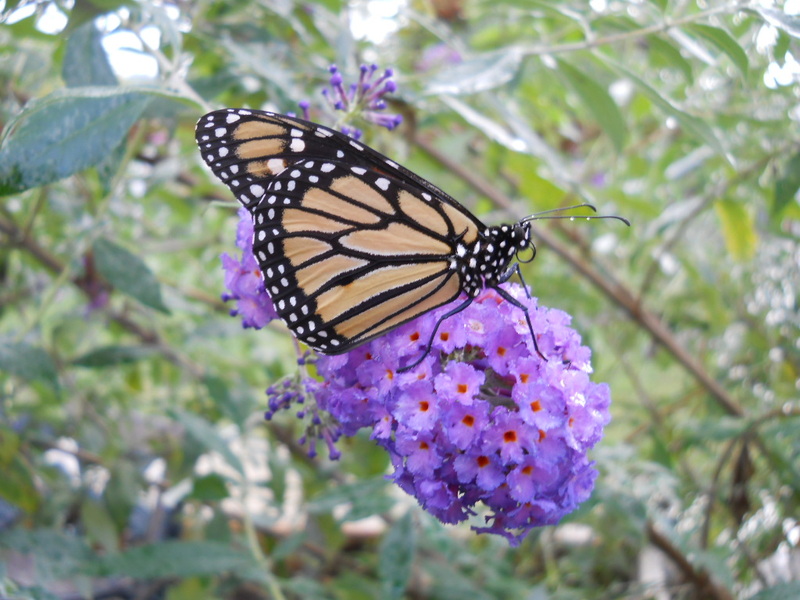 The first butterly photo in this post is of one of the Monarchs sitting on a butterfly bush, and the second butterfly may be sitting on a variety of Pentas, but I’m not sure. There were dozens of Monarch perched on the butterfly bush, and i t was quiet a thrill to be so close to these beautiful creatures and to be able to get such good close up shots. 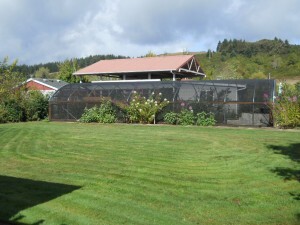 The pavilion, though rather small, is filled with bushes and flowers that provide the butterflies with nectar. 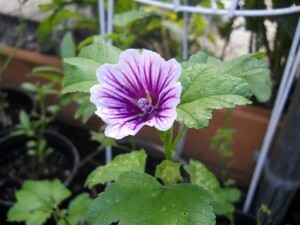 The flower under the second butterfly is a Mallow, which is a host plant for the Painted Lady butterfly. The flower under that one is a Pentas for sure. 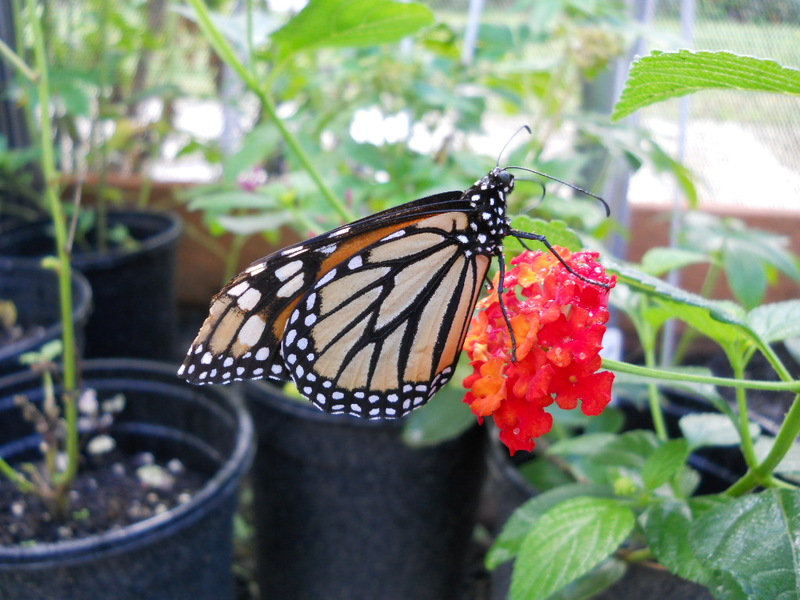 Outside was a bountiful garden full of many of the flowers that monarchs and other butterflies use for nectar, and hedges of milkweed that the monarchs feed on were scattered in different places. What I learned that is very important for me when I plant the milkweed that I am growing is that it does very well in hedges. I think I know a place in my garden that will be appropriate for them, but there are no guarantees that any monarchs will find them to lay their eggs on, but maybe they will get a snack on their way to better places. We’ll see. The photo of the orange flower under the butterfly pavilion photo is a currasavica. 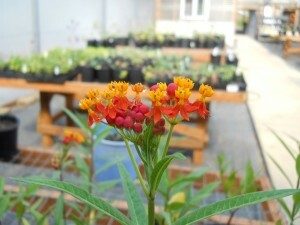 It is an annual type of milkweed. I will post the names to the other plants when I find them. 1. Monarchs mate for the first time when they are three to eight days old. Mated pairs remain together for up to 16 hours – from afternoon to early the next morning. Both sexes mate several times during their lives. 2. Females prefer to lay eggs on young milkweed plants, most often on the underside of the leaf. 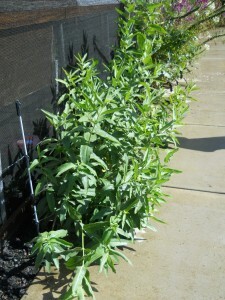 By scattering eggs over many plants, monarchs increase the chance that some of their offspring will survive. 3. The egg hatches in three to four days and the young caterpillar eats its own eggshell as its first meal. 4. The larva devours milkweed leaves. Monarch larvae do not feed on any other plants, although they do eat many different species of milkweed. 5. The caterpillar molts or sheds its exoskeleton (skin) four times as it grows. The interval between each molt is called an instar. The larva goes through five instar. During each instar the body grows, but the head size stays constant. 6. The larva eats voraciously for about two weeks and grows to approximately two inches in length. The fully grown larva seeks out a place to begin pupation. 7. The larva finds a location under a leaf or overhang, attaches itself with hooks in the last pair of legs to a silken pad, and forms a pre-pupal “J” before shedding its skin for the last time. 8. The larva splits its exoskeleton and wiggles out of its old skin, revealing the new skin (cuticle) of the pupa. The cremaster, a spiny appendage at the end of the abdomen, hooks into the silk pad as the larval skin is shed. 9. The chrysalis (pupa) stage lasts for approximately two weeks. The mature butterfly becomes visible through the pupal cuticle during the last 24 hours of this stage. 10. The fully-developed butterfly within the pupa performs a series of contractions to expand the pupal cuticle. The contractions split the covering and allow the butterfly to emerge. Upon emergence, the butterfly begins to inflate its wings to full size. 11. After a few hours, the adult monarch begins to fly and to gather nectar from flowers. 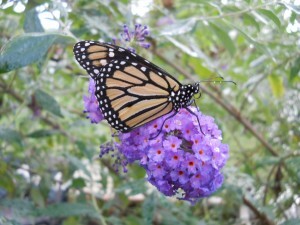 Adult monarchs feed on nectar and water for the remainder of their lives. The life cycles from egg to butterfly takes approximately 4 – 5 weeks. The main function of the adult is to reproduce – to mate and lay eggs that will become the next generation. The monarch butterfly is native to North, Central and northern South America. 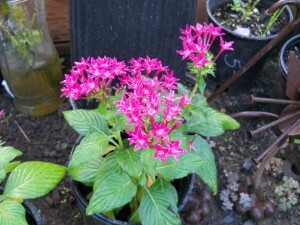 It has been accidently introduced to numerous islands in the Pacific and Atlantic. In the spring and summer monarch’s habitat is open fields with milkweed. In the fall monarchs seek forested areas with a specific microclimate – overnight temperatures above freezing but cool in the daytime. Monarch butterfly larvae feed on milkweed. Adults gather nectar from flowers. Because most milkweed contains bad tasting chemicals (glycosides), that are incorporated into the adult, monarchs are distasteful to predators. We picked a gorgeous day for this excursion. Early fall is a good time to visit these gardens because it’s not so hot and there are plenty of flowers still in bloom. Most of the vegetables from the community gardens had been harvested, and there was still some produce for sale in the market café. I bought some huge Anaheim peppers so I could finish one last batch of salsa from the two pots of tomatoes that were waiting for me at home. It was quite impressive how well organized and cared for their flower gardens and growing areas were. The entire community and the high school students at Elkton High work these gardens and participate in all aspects of the planting, growing and harvesting process. I was very impressed by how organized they were and the practical layout of their facilities where they do their propagating and other activities and workshops. I’d recommend visiting this wonderful community center and gardens. WWF’s Website has some good information on the monarch butterflies and why their numbers are declining drastically.